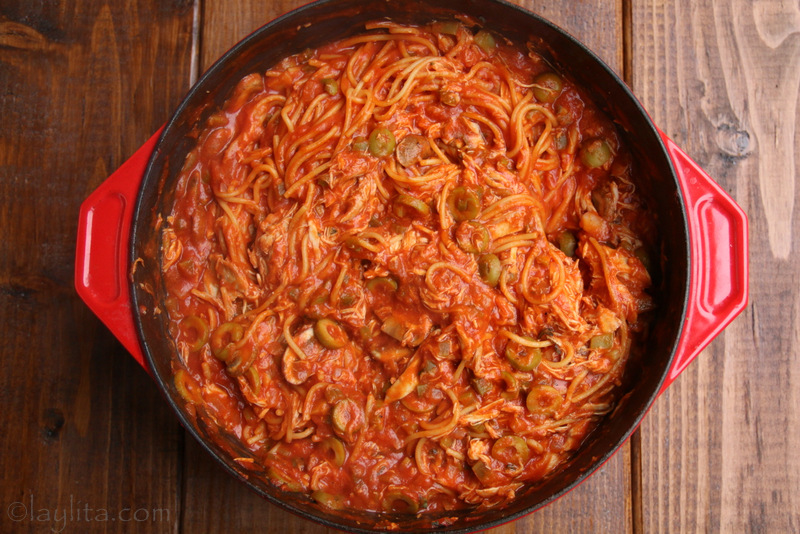 This is my grandmother’s delicious chicken spaghetti recipe and is made with chicken, olives, mushrooms, onions, garlic, peppers, tomato paste, and more yummy ingredients. This chicken spaghetti is prepared by cooking the spaghetti or pastas in a sauce made with onions, peppers, celery, garlic, tomato paste, chicken broth, olives, mushrooms and spices. In Ecuador, we use the word “tallarines” or “tallarin” to refer to any dish that has spaghetti or linguini pastas, and tallarines de pollo have always been one of my favorites. 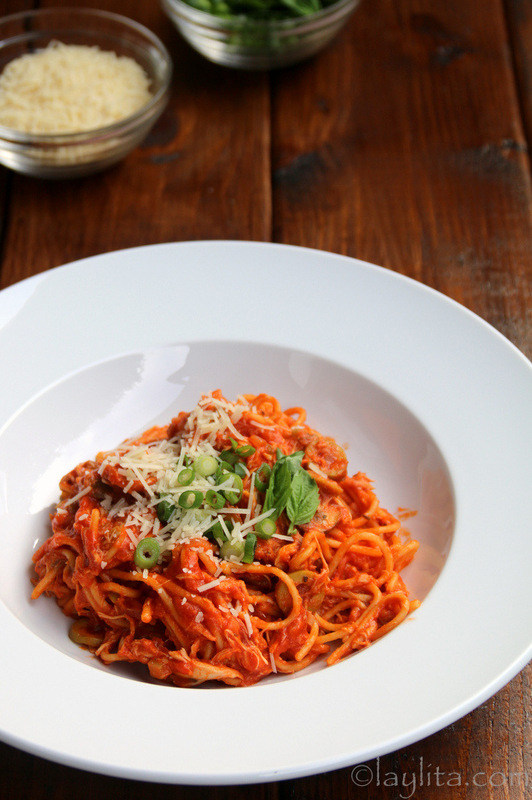 We also use the word “fideos” to describe very thin noodles or any other shape of pastas. 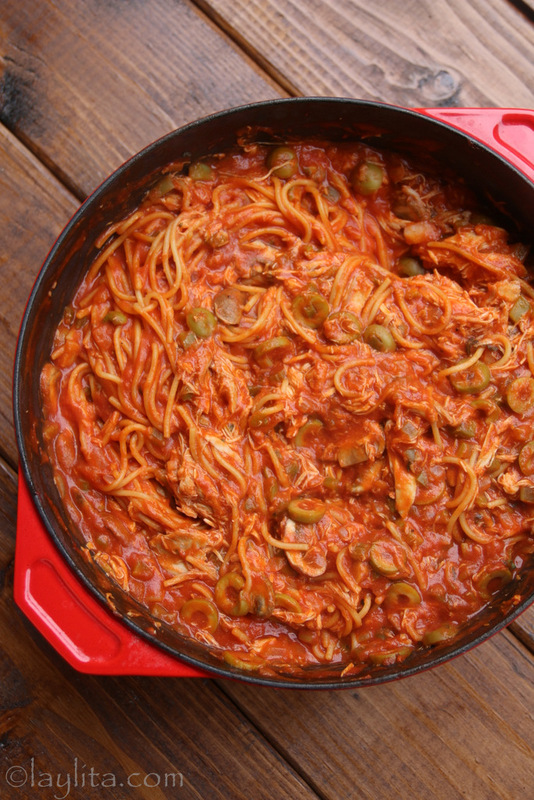 Homemade chicken spaghetti recipe prepared with chicken, onion, peppers, celery, garlic, tomato paste, chicken broth, olives, mushrooms and spices. Place the whole chicken, onions, carrots, celery, garlic, salt, pepper and water in a large stockpot and bring to a boil, cook until the chicken is tender. Drain the chicken and reserve 8 cups of chicken broth for later use. Debone the chicken, I got about 4 cups of chicken meat. Heat the olive oil over medium heat in a large stockpot; add the onions, green pepper, celery and garlic. Cook until the onions soften, about 5 minutes. Mix in the tomato paste and add the reserved chicken broth, bring to a boil. Add the olives, mushrooms, bay leaf, chili powder and spaghetti. 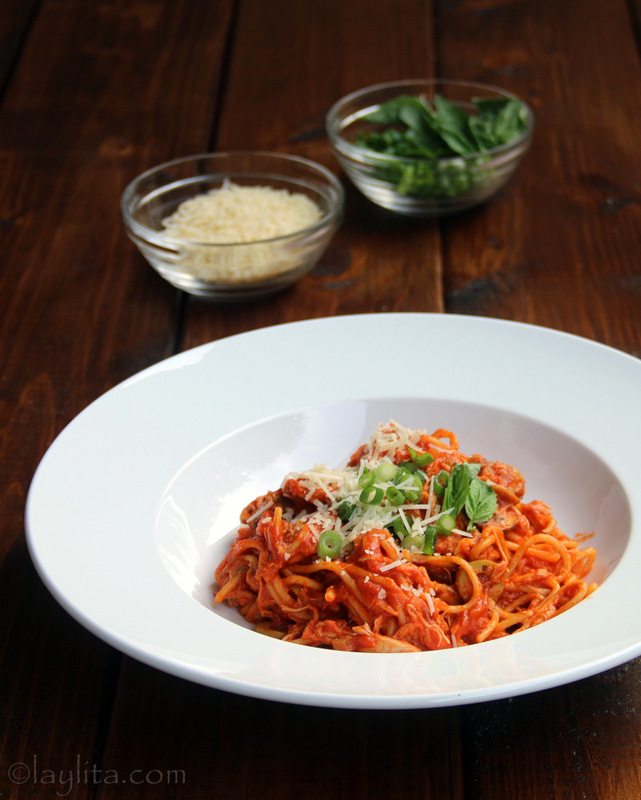 Cook until the spaghetti is tender or done to desired level of tenderness, about 12-15 minutes. Add the chicken meat and stir well, add salt and pepper to taste. 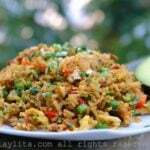 Serve with grated cheese, fresh basil and chopped scallions. For a shortcut version of this recipe, you can use leftover or store bought shredded chicken with store bought chicken stock. My grandmother’s chicken spaghetti is one of my favorite comfort food dishes. I lived with my grandma for a few years when I first moved to the US, and was so happy when she would prepare this. 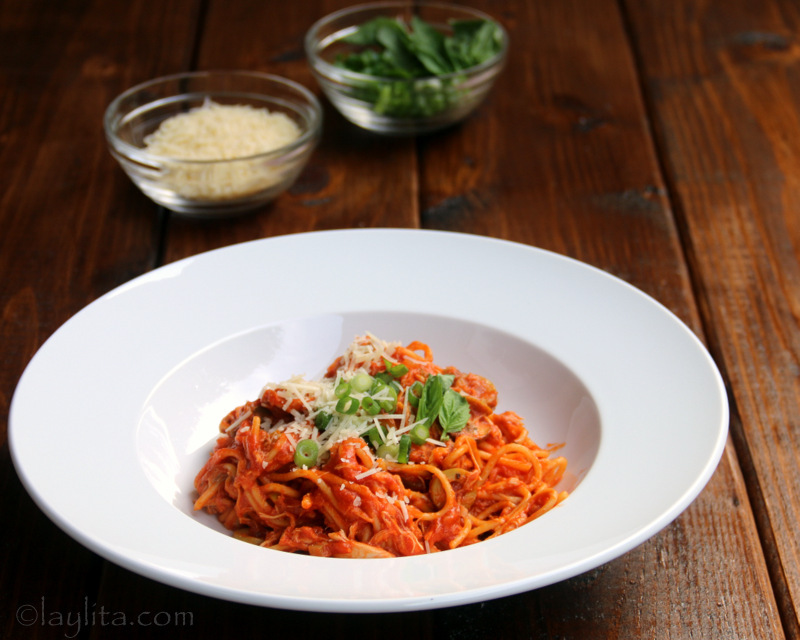 Later when I would visit, she would prepare this spaghetti dish for me since she knew it was one of my favorites. Of course, these days, she cooks less than before, I live farther away and can’t visit as often, so when crave her chicken spaghetti I prepare it myself. My grandma contributed this recipe, and a few others, to a recipe booklet for a church fundraiser, and she gave me a copy of it so that I would have some of her recipes. That booklet is a treasure, not just because it has some of my grandmother’s recipes, but it also has some classic Southern Texas recipes – including a recipe for baked squirrel, but don’t worry I don’t plan to try that one anytime soon. Though I think baked squirrel might go great with some chimichurri sauce or roasted a la Ecuadorian cuy style. like your recipe. Eat it with some charro beans and a little bit of queso fresco. I’m going to try your recipe. I love pasta. 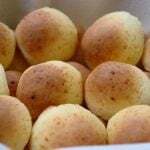 I think this looks so beautifull.I want to learn how to make it myself but I am not sure that I could do it like that.thank you for your recipe I will try to use it as soon as possibe. what kind of olives??? black or green? I used green olives, but black ones are also fine. Hi Doris – Thank you for your comment, the tomato paste cans are the small ones (6 oz. ).